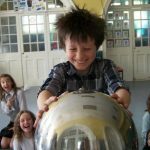 Why not try your own experiments at home to get your kids excited about science. We’ve searched the internet to compile this list of 5 great reactions to do at home. You can even invite friends, family or even the neighbors to get involved! All of these activities are simple and easy to follow, keeping the kids entertained for hours! SAFETY ALERT- some experiments may include chemicals that could be dangerous if swallowed in large quanities (e.g. washing up liquid) so adult supervision is required at all times. This is not just simple strawberry or chocolate milk shake – it is more exciting and entertaining. This experiment uses everyday kitchen ingredients to create a spectrum of colour. All you need is milk, food colouring and some washing up liquid. Simply fill a bowl with milk, add a few drops of food colouring and then touch the surface of the milk with a drop of washing up liquid on a cotton bud or your finger. The main purpose of the experiment is to show the children how the fat and protein molecules react to the soap. 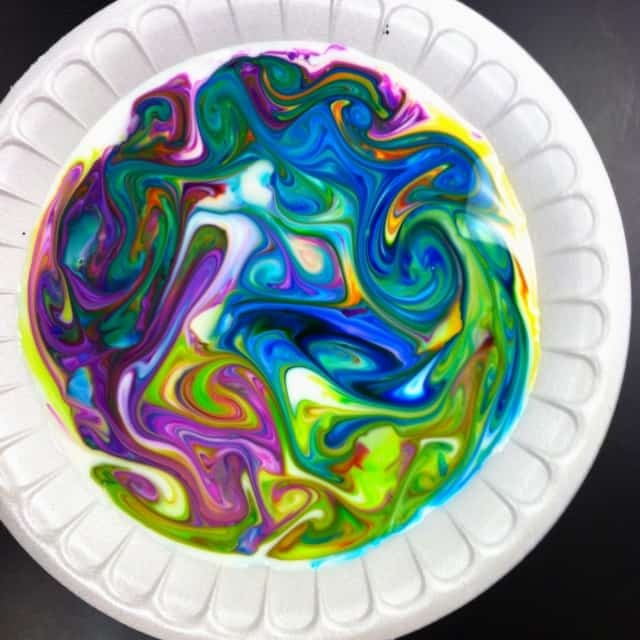 The soap molecules try to mix evenly with the fat molecules, moving the food colouring around in swirls and patterns. 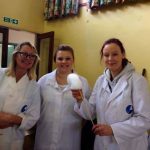 For more information about this fun and exciting experiment visit the website below which also provides a step by step video and explains what you will need to carry out the experiment. A quick and easy experiment magically transforms a penny in 5 minutes. Again, basic ingredients are needed for this experiment, just salt, vinegar, a bowl and a few old pennies. Turn your boring old, dull pennies into shinny new pennies in no time whilst showing your children a great chemical reaction. Visit the link below for more details and a step by step guide of how to carry out this fun and easy experiment. This is one of my favorite experiments and kids (and adults) of all ages love it!. Be aware you can get messy and this is best to do in the summer as it needs to be done outdoors- not in your kitchen! All you will need for your experiment is a bottle of coke and mentos – diet works best and also is easier to clean afterwards! 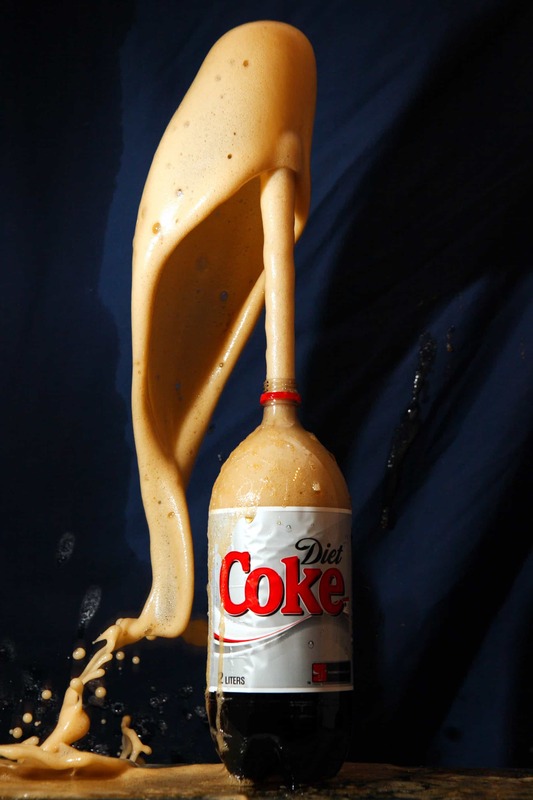 Pop the mentos (around 7 works well) into the coke bottle (2 liters is best) and watch the drink erupt. Remember to stand well back as it can be very powerful. Experiment with different numbers of mentos and different fizzy drinks. 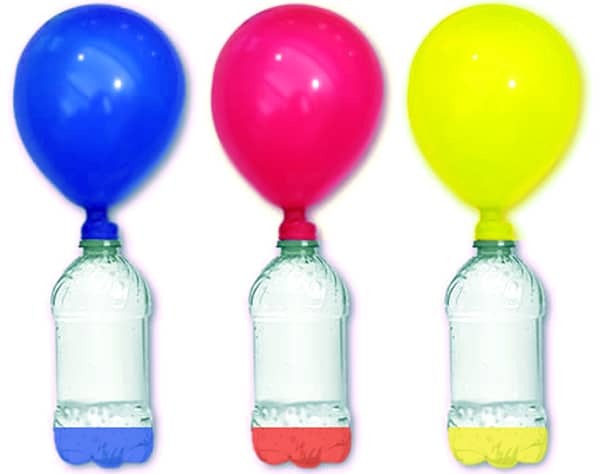 Inflate a balloon using simple household objects! All you will need is a balloon, vinegar, an empty bottle and baking soda. This is a quick and easy activity that can be carried out at home, indoors or outdoors. Simply pour around 50ml of vinegar into an empty bottle, put two teaspoons of baking soda into a balloon and then spread the neck of the balloon over the top of the bottle. When you lift the balloon up, the baking powder will fall into the bottle, mix with the vinegar and make carbon dioxide gas. The gas expands which fills the balloon with air! This experiment uses everyday house hold objects. Write a secret message to your friend or even pretend to be a secret agent! Only your children will know the secret and can amaze their friends with the special ink. Children will learn about how vinegar oxidizes and turns brown when it interacts with heat. Why not give the experiment a go and see if it works with other substances such as lemon juice and even milk! Visit the link below for more information about this experiment.